Many new processors include a Neural Processing Unit (NPU) – aka Neural Network Accelerator (NNA) – in order to speed up talks associated with artificial intelligence, such as object or other patterns recognitions. 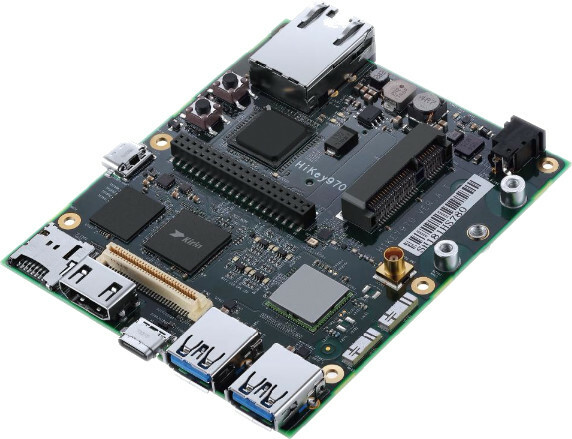 With Linaro Connect Hong Kong 2018, 96Boards has just unveiled four development boards specifically designed for artificial intelligence solution with Hikey 970 powered by Hisilicon Kirin 970 processor, Ultra96 based on Xilinx Zynq UltraScale+ ZU3EG ARM+ FPGA SoC, and ROCK960 PRO & Enterprise Edition featuring the upcoming Rockchip RK3399Pro processor. Power Supply – 8 to 18V via power barrel and maybe USB-C port? The board is expected to be used for deep learning in the automotive, robotics, and smart cities sectors . It will be available “shortly”, but no price info for now. Development can be done with SDSoC Development Environment or Vivado Design Suite, and supported software stacks include reVISION, OpenCV, and Caffe. 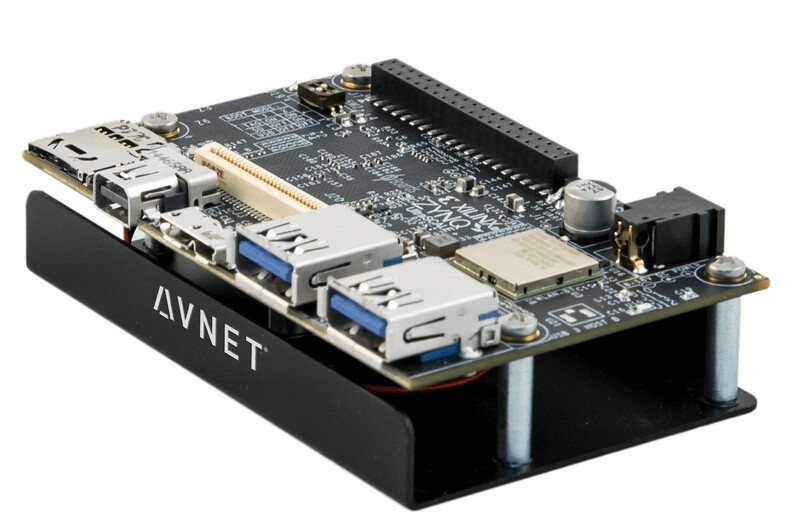 The board can be used for machine learning, automotive (driver assistance, infotainment, etc…) and Industrial IoT. Ultra96 CE board can be pre-ordered now on AVNet for an undisclosed price (you’d need to request for a quote), but the price should be $249 with delivery in 6 weeks. The PRO version is the basically the existing ROCK960 board with Rockchip RK3399 replaced by Rockchip RK3399Pro with NPU. Soc – Rockchip RK3399Pro hexa core processor with 2x Cortex A72 cores, 4x Cortex A53 cores, Mali-T860MP4 GPU, and 2.4 TOPS capable NPU (apparently CEVA NeuPro). Rockchip collaborated with Open AI Lab to port Open AID on ROCK960 allowing for easier development of vision and speech applications on the edge. Vamrs ROCK960 RK3399Pro boards are expected to launch later in Q2 2018. For more details on all three boards, head over the dedicated 96Boards AI website. Documentation is still very much under construction at this stage , but it should get better over time. Ultra96 seems to be have the most up-to-date documentation at the time of writing. The boards were also unveiled, and in the case of Ultra96 showcased at Linaro Connect HK’s keynote by George Grey, Linaro CEO. 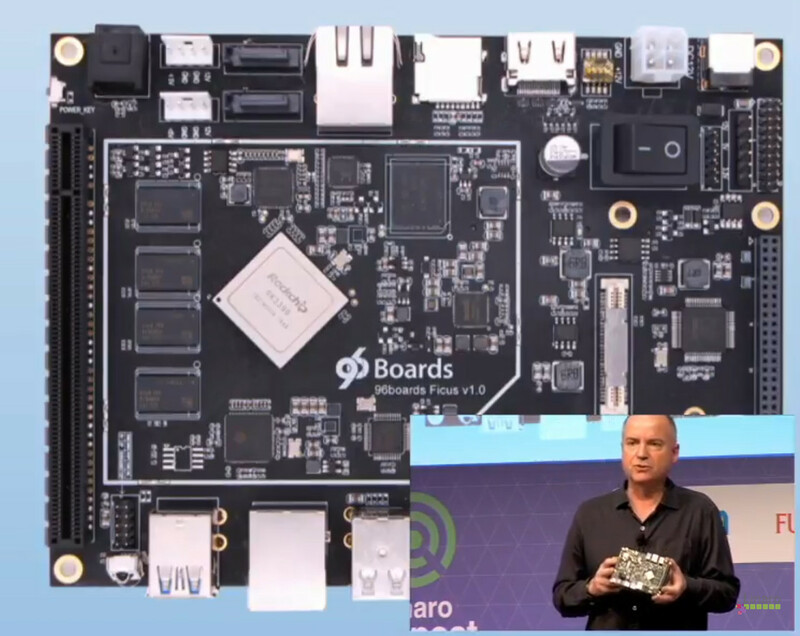 Linaro/96Boards also announced the availability of DragonBoard 820c, and you can order it for $421. The board will also support artificial intelligence acceleration in H2 2018. They start talking at 12:58 detailing the schedule of Linaro Connect for the week, but the keynote itself begins at 21:40, and you’ll want to fast-forward to 58:00 for the section about the new “A.I.” 96Boards. Honest question, am I just stupid for not understanding this form factor? I mean great, it’s for product development, but there’s no logic to it and the expanded board sizes don’t seem to follow any logic at all. 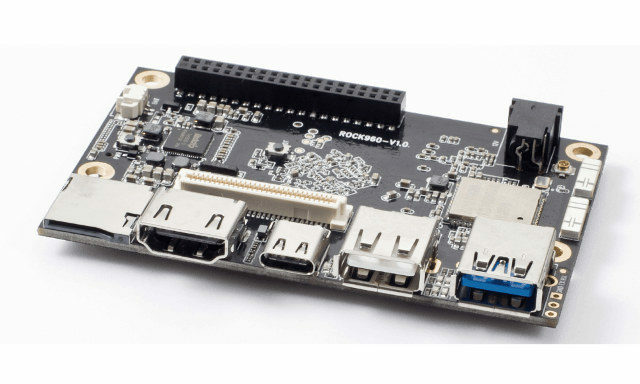 Even the Rock960 Pro has what looks like an M.2 connector that goes off the side of the board, so how are you supposed to make it “stick” to the slot, since the M.2 cards can’t be held in place like that? p.s. nice looking new site design, feels a lot less cluttered. Is it just me, or does something look different. There is a surfeit of white space which makes reading articles much more difficult. Has this been deliberately done to stop people skimming articles and stay longer on the web site. Even the comments layout is now much more spread out and similarly awash in white space. Reducing the page zoom level to below 100% to try and shrink the excess white space then makes the text too small to be comfortable for extended reading. Also, all the white is hard on the eyes (a well known fact). It would be far better to use a very slightly graish backgroun to reduce retina burn. yes, all that whiteout makes reading difficult…. Note: There is an error in the specification of “ROCK960 EE version” – Ficus, RK3399 can support up to 4GB ram, there is no exception for Ficus. For RK3399Pro, it’s unclear that if Rockchip will improve the DRAM controller now. It’s highly like that RK3399pro will also limit to 4GB ram. I suspect they (ROCK960 EE version) are pulling a “RPi 3B+” trick on this board. The RK3399 only has 4x PCIe lanes, not 16x. The connector may be 16x, but 12x lines will be “no connect”. This also implies the SATA is USB3 attached. P.S. Really don’t care for the new web site layout. I would call it “visually hostile”. I don’t think they’re pulling a “RPi 3B+ trick” since different target audience (clueless people buying cheap toys vs. expensive RK3399 dev board). Nice! Thanks for the stats, @tkaiser! To get an idea about ‘maximum’ throughput you would need to use 8MB or even better 16MB and then RK3399 with Gen2 x4 gets close to or above 1500 MB/s (depending on the benchmark tool in question as usual). While this is a proof that RK3399 is able to process data at this rate internally it’s important to not draw the wrong conclusions! Attaching a PCIe SATA or SAS controller for example making use of Gen2 x4 will most probably not result in getting an overall throughput of above 1000 MB/s since now running in IRQ affinity issues and being bottlenecked by this. NVMe on the other hand with IRQ ‘locality’ and designed to be fully multithreaded solves this problem. Once again a nice example that incremental specification/standard updates as we’ve seen with PATA –> SATA (or oversimplifying SCSI –> SAS) are not sufficient any more if hardware has changed too much. BTW: Vamrs’ choosing JMS561 to provide two USB3 attached SATA ports isn’t a terrible choice as long as they advertise it as ‘great for HDD use’. Then the JMS561 will be perfectly fine even behind an internal USB3 hub. It’s basically the same solution like with ODROID XU4 + Cloudshell 2 just minus cable/connector problems. And hopefully also not the usual under-voltage hassles SBC users regularly run into… but AFAIK 96boards standard always requires sane powering (well above 5V DC-IN)? We’ve been very carefully using words for specifications since we know our customers are experts here. Here we use PCIe 2.1 x16 slot, not 16 lanes. RK3399 has only 4 lanes PCIE. A x16 pcie slot is the required specification of 96boards EE standard. For SATA, we use JMS561 USB3 to dual SATA, when can archive relative good performance. If you want more speed, grab a PCIE to M.2 card, you can have native PCIE SSD. If you want more SATA, grab a PCIE to SATA card. Just had a look at the slide and realized that the EE board provides 3 x USB3 and 5 x USB2. So obviously internal hubs are used. In case there’s also USB-C I would assume that the JMS561 is also behind the USB3 hub? I hope you are aware that firmware issues with JMS561 can prevent querying the 2nd disk correctly with SMART? Hardkernel had this problem last year on their Cloudshell 2 dual disk accessory which is one of the reasons I tried to stay away from JMS561 so far. The Rock960 link points to the Dragonboard 820c product. And, yeah, the new layout is way harder to read and wastes a lot of whitespace. I find it difficult to read the article and comments, now. What device / screen resolution are you using? Sorry, was that to me? You can’t tell who replies go to in the new layout. I’m using Firefox on Linux (F27). My screen is 1366×768 and I have a big tab bar on the left. I also find harder to read. The new design has too much white background and comments section is too wide. I’m using Windows 7(64bit) / Firefox 59.0.1 / screen resolution 1920×1080. Maybe the old design was starting to show his age, but I just hope the new design is work in progress and that it will look better over time. Looks like my earlier comment disappeared into the Ether. Anyway, I do think site’s readability was better before, so hopefully the themes can be tweaked a bit. Are you sure about “Video Output – HDMI 2.0a” in the specs of the HiKey 970? I probably took the specs from one of the slides or some documentation available at the time, but looking recent product pages, it looks to be HDMI 1.4, and limited to 1080p60, i.e. no 4K 30Hz. Yeah, I wished that you would have responded with some secret insider information of a last minute change. The adv7535 is indeed limited to 1080p.